MSD Animal Health has been the sponsor of ESVE since its inception in 2001. 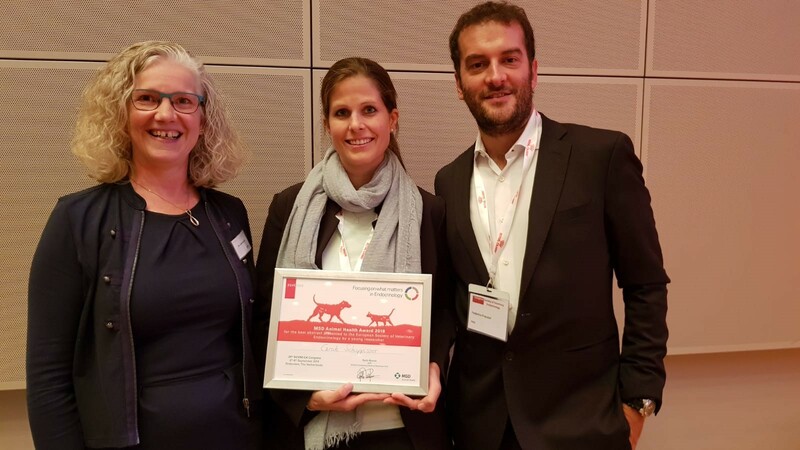 As part of its annual sponsorship program to encourage research in the field of veterinary endocrinology, MSD Animal Health also awards an annual prize for the best abstract presented at ESVE by an author under 35 years old. As of 2007, the winner will get to present their abstract during the next ACVIM congress with the MSD Animal Health award (value of € 1,000.00) supporting attendance of this congress. 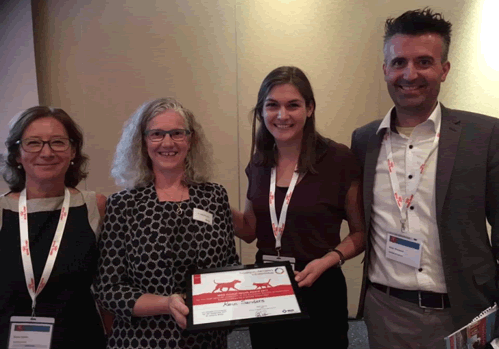 2018 award winner Dr Carole Shuppisser (middle, Zurich University) with Linda Horspool (left, MSD Animal Health) and Dr Federico Fracassi (right, President ESVE) in Rotterdam, the Netherlands. Dr Shuppisser was awarded first prize in the oral abstract presentations and will travel to ACVIM in 2019 to present her abstract at the ACVIM forum. 2017 award winner Dr Karin Sanders (Utrecht University) with Dr Linda Horspool (MSD Animal Health), Dr Stijn Niessen (President ESVE) and Dr Sara Galac (Past President ESVE) in Malta. Congratulations to Drs Chris Scudder of the Royal Veterinary College (left) and Karin Sanders of Utrecht University (3rd person from left) with their respective prizes for best oral abstract presentation during the 2016 endocrine stream of ECVIM! Thank you to MSD and Linda Horspool for sponsoring the first prize for best endocrine abstract! 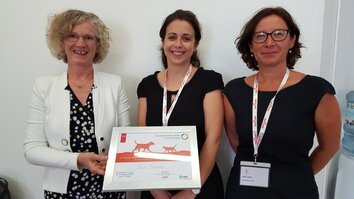 2015 award winner Dr Yaiza Forcada (middle, RVC, London) with Linda Horspool (left, MSD Animal Health) and Dr Sara Galac (right, Past President ESVE) in Lisbon, Portugal. 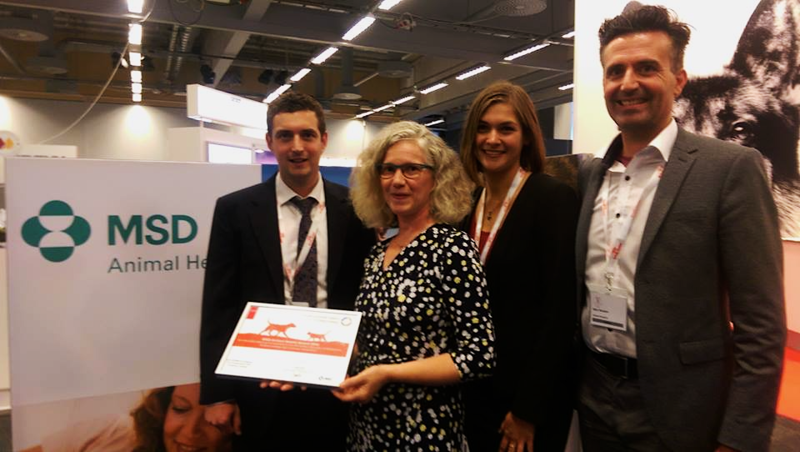 2014 award winner Chris Scudder (RVC, London) with Linda Horspool (MSD Animal Health) in Mainz, Germany. 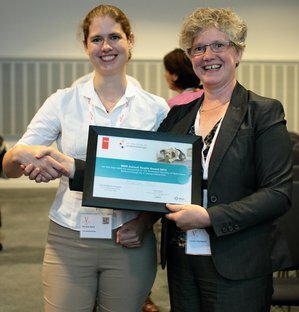 Winner Miriam Kool in 2013 for the abstract entitled ACTIVATING MUTATIONS OF GNAS IN CANINE CORTISOL-SECRETING ADRENOCORTICAL TUMORS; the award was presented by Dr Linda Horspool (right) of MSD Animal Health. 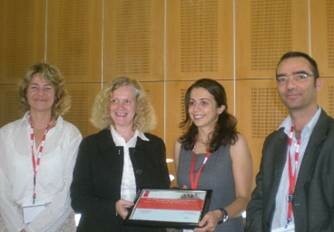 2010 award winner Yaiza Forcada (RVC, London) with Linda Horspool (MSD) and Sylvie Daminet and Dan Rosenberg (ESVE-board).